Book:Health and Nutrition for DOGS and CATS:A Guide for Pet Parents by David G. Wellock, ENTER TO WIN! As many of you know who have followed Dakota’s blog for some time now, I consider myself to be a “dog hobbyist or a pet parent.” Dakota is the first dog that I have had the pleasure of sharing my home and life with as an adult, and the only other dog that I shared my life with was a Boxer named Brandy when I was a toddler. As a “dog hobbyist or a pet parent” there are red-flag topics that I felt that I wouldn’t broach on his blog, and were better left to those in the dog blogging world that I consider to be “Dog Experts, (either by virtue of their “pedigree” or their life experience).” What topics are those? I have always felt if I were going to attempt to discuss my red flag topics it would boil down to regurgitating information from the internet, but much of that information is difficult to understand, and taking the time to peruse it? Much worse! For those of you who are like me, “dog hobbyists or pet parents” and need and would like information and guidance from those that ARE “in-the-know”, our prayers have been answered! Enter the book Health and Nutrition for DOGS and CATS: A Guide for Pet Parents by David G. Wellock, which I am delighted to say was sent to me by the author, to share with all of YOU! There you have it, a book written for the “dog hobbyist” (as I like to refer to myself) or as Dave lovingly says “parent of a pet” or “paropet.” A book written in language that even I can make sense of, I am certain that you will be able to as well! HOW TO ENTER: just leave a comment telling me what your dog’s (or cat’s or pig’s or whatever!) favorite food is (the “favorite food” can be “people food” or commercial!) The give-away is open NOW and will end MONDAY JUNE 17TH AT 5PM. Comments that do NOT follow the requirement will be disqualified. WINNER will be chosen by random.org and will be announced WEDNESDAY JUNE 19th. 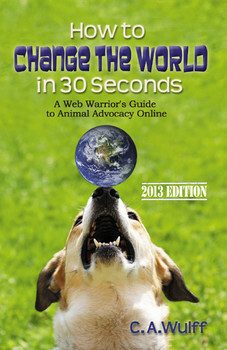 If you can’t wait to see who wins the contest, you can purchase Health and Nutrition for DOGS and CATS: A Guide for Pet Parents, in either hardcover form or as an ebook by visiting the publisher by clicking here, or visiting Amazon by clicking here, or visiting Barnes & Noble by clicking here. 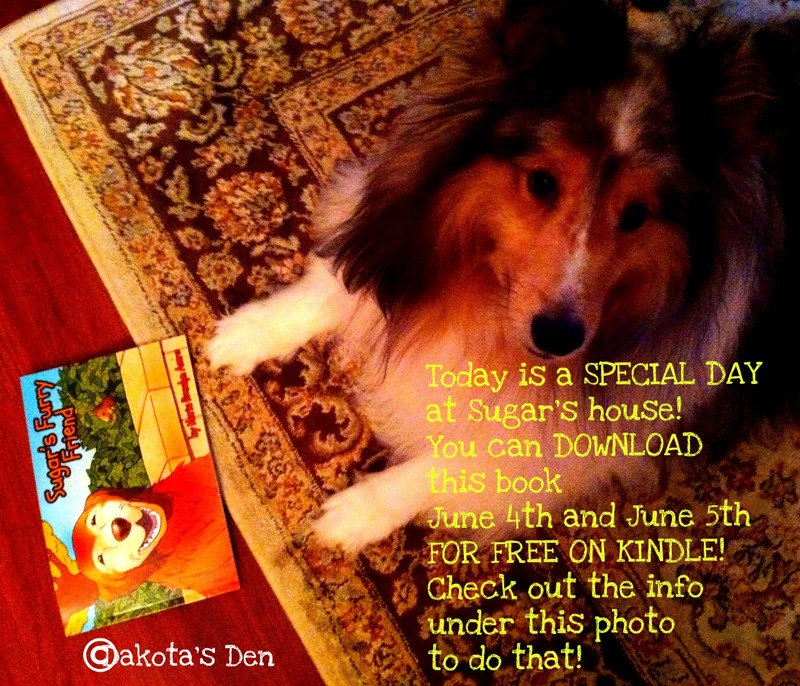 Book:”Sugar’s Furry Friend” by Author, Maria Rosalyn Acero: FREE on KINDLE, June 4th and June 5th only! 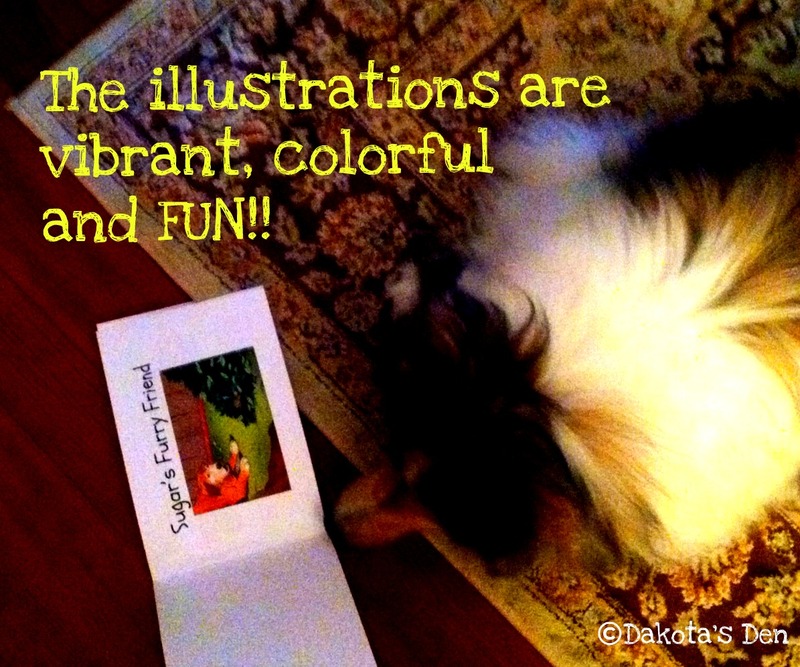 It’s Dakota and I have some pawsome news for you today! 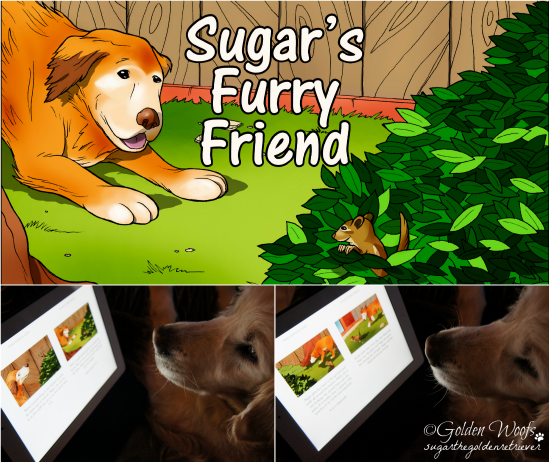 When Mom was at BlogPaws, one of her most favorite things was getting to meet Sugar The Golden Retriever’s Mom, Rosalyn! It was ALMOST as good as meeting Sugar herself! 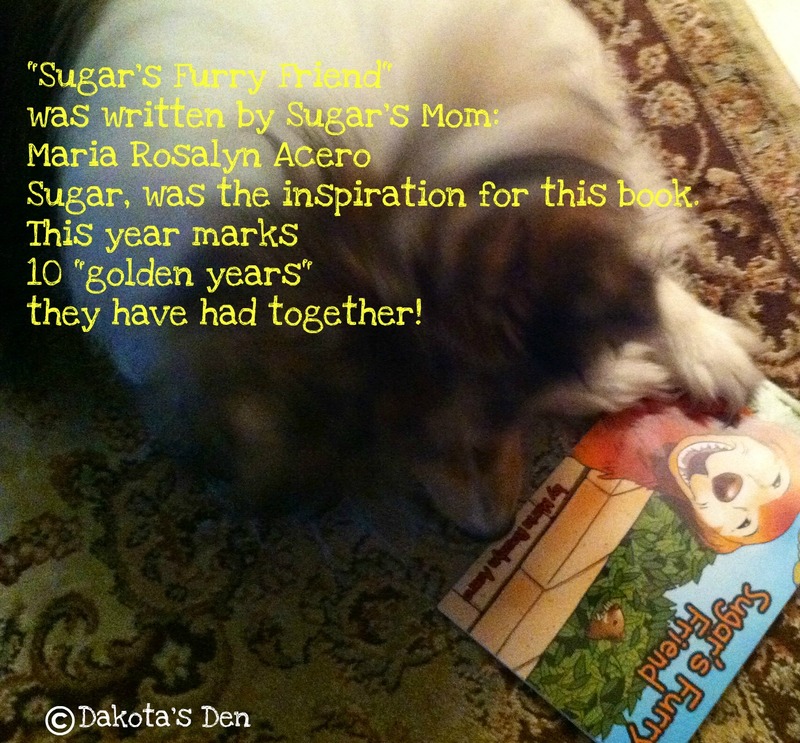 When Mom met Rosalyn at BlogPaws, Rosalyn gave Mom a copy of a special book that she wrote in honor of “10 Golden years” she has spent with Sugar! Here it is! Isn’t this just the BEST!!?? I am honored to feature this interesting and informative book about REX THE BLIZZARD KING. This book is packed with so much information that there is no way that a “review” would even begin to cover it all. I wrote to Jim and told him that I would introduce this book (and Rex) to all of you as a feature, and give you a snippet of what it is about. FROM THE PUBLISHER: REX THE BLIZZARD KING was a noble, loving, hero dog, whose legacy carries on today. A purebred Samoyed who lived from 1946-1957, he was involved in more than 30 rescues of humans. He was awarded a place of honor in the U.S. Postal Hall of Fame for his work as Lead Sled Dog on a U.S. mail run. became a favorite of John Wayne’s on the set of Island in the Sky, and famously “blazed the trail” to the stranded City of San Francisco passenger train struck at Yuba Gap near notorious Donner Pass in California in January 1952.
really did live a life of service to mankind like Rex. history too in the process. JIM CHESKAWICH has served as Samoyed Club of America president and treasurer, and is currently the treasure of the SCA Education and Research Foundation. 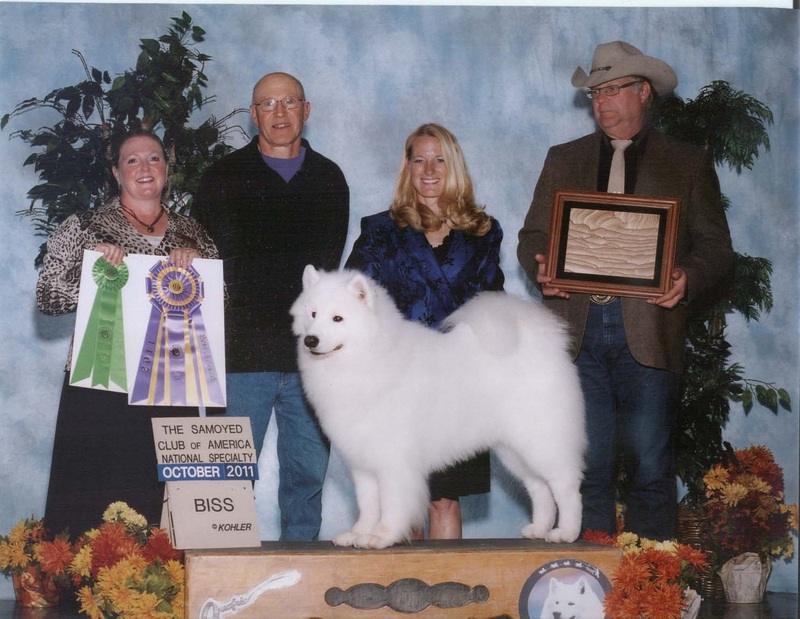 Jim has a Samoyed that is a descendant of Rex, his award winning Samoyed, Riley! Jim’s dog Riley, winning nationals. Samoyeds lovingly called “Sams” or “Sammys” by their owners and fans, are enjoyed today for their beauty, companionship, intelligence, and working versatility. As a working dog, Samoyeds are used to herd sheep, ducks, and cattle and can be found in sledding races and weight pulls held throughout the U.S. The heart and loyalty of the Samoyed make it an exceptional dog. 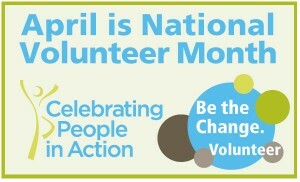 Many of you saw my blog post from April 15th, where I featured the book “How To Change The World in 30 Seconds” by C.A. Wulff. She is one talented author! 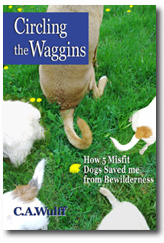 Today, I have the pleasure of presenting to you “Circling the Waggins, How 5 Misfit Dogs Saved Me From Bewilderness” also by Author C.A. Wulff. Living in a rugged log cabin in a National Park can be challenging for two middle-aged women; especially when one has physical limitations and the other’s mental illness is a wilderness of its own. Add in the daily trials of senior pet care, plus a mouse rescue gone comically awry, and it might just be a recipe for disaster. But even as the two women care for, and say goodbye to, longtime companion animals, a pack of misfit dogs enter their lives to keep them grounded. The couple find a new awareness and understanding of the experience of living. Just when you think that you cannot bear to experience the loss of a beloved animal again, you find another, and yet ANOTHER, each unique, each special, each needing love, and you learn that YES indeed you CAN (and you will) dedicate your life to an animal again. If you love animals, you will love Circling the Waggins. You will smile, nod your head in recognition and yes you will cry, you will be as moved by the dedication of C.A. Wulff and her partner Dalene, as I was. It’s not that I dislike cats. Cats are beautiful animals and make lovely pets. Perfectly fine pets for SOMEBODY ELSE to have. I have loved felines in the past, counting myself fortunate to have known them. But over the years, I’ve come to understand that I find relationships with dogs much more rewarding. One of the things I dislike about our current group of cats is their blatant disregard for our furniture and carpeting. They remind me of wild and uncontrollable rock stars who trash hotel rooms. My role in the relationship with them has evolved into little more than a janitorial service. I must be part cat because I felt my hair beginning to stand on end and my claws began extending. I had my first cat for 18 wonderful and MEANINGFUL years. He was my soul mate, he lived for me as much as I lived for him. The unbearable devastation and pain I felt when he passed, was excruciating as all of us who have loved and lost beloved pets know. The above couldn’t be FURTHER from the truth IN MY WORLD. I won’t lie. This passage and a few other cat references didn’t sit well with me. What would I do if my dog or cat were to be diagnosed with cancer? If you have ever rescued an animal, loved a pet (dog OR cat) with your entire being, sacrificed for your pet, and experienced the unconditional love that they offer in return, you will appreciate Circling the Waggins and be able to relate to the “Circle Of Life” going on. C.A. Wulff has generously offered my readers a $5 discount! Today, I am featuring the second book in the Planet of the Dogs series, Castle In The Mist. With all the horrible things taking place in the U.S lately (specifically Boston) we could all use ( particularly children) a story with a happy ending. Out in space, on the other side of the sun, is the Planet Of The Dogs where dogs live in peace and happiness. This is the story of how the dogs came down to planet earth to prevent war in the land of the forest people and free the kidnapped children from the Castle In The Mist. Dogs are all about love. In fact, the most special thing about dogs is their ability to love. They do this better than any other creature. After a year of peace Bik, the warrior-chief of Stone City, is preparing for war. His children have been kidnapped by Prince Ukko, the leader of the Black Hawk tribes, and held prisoner in the Castle In The Mist. This is the story of how the dogs came down from their planet, to the land of the Forest People, to free the children and prevent war. The Black Hawk soldiers had never seen dogs before. They had no knowledge of their courage, cleverness and endurance. And they had no idea that the dogs, through their extraordinary sense of smell, could see in the darkness and foggy mist that enveloped the Castle and the great forest. Full of action, adventure and colorful descriptive language, it will delight elementary school children everywhere! 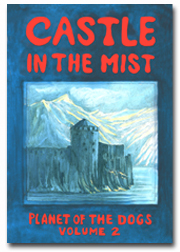 ENTER TO WIN: one lucky person from ANYWHERE in the world, will win one copy of Castle In The Mist. Just leave a comment telling me you would like to be entered. The winner will be chosen by http://www.random.org and will be announced THURSDAY, APRIL 25TH. GOOD LUCK! ABOUT THE AUTHOR: Robert McCarty is a producer/writer/director of films and videos on subjects ranging from teenage lifestyles to race relations. His short film,Rooftops Of New York, was nominated for an Academy Award. He is a former adjunct instructor at Teacher’s College, Columbia University and at the School Of Visual Arts, New York City.Planet Of The Dogs was inspired by the many stories made up for his four children and five grandchildren. ABOUT THE ILLUSTRATOR: Stella Mustanoja McCarty, who teaches painting and drawing at the Vantaa, Finland, Art School, illustrated the book. She graduated as a painting major from the Art Academy in Helsinki and also holds degrees from the University of Helsinki in Education and Sociology and Social Policy. I was recently sent a copy of a clever book for the elementary school crowd, (ages 7-9) that is witty, fun, educational and has some pretty darned great illustrations to boot! The book is Claude in the City, which was written and illustrated by Alex T. Smith. Having an artistic eye myself, what I love about the appearance of the book is that it is entirely done in the eye-catching color combination of red, black and white. I found that to be refreshing, bold, exciting and sure to catch a little one’s eye! 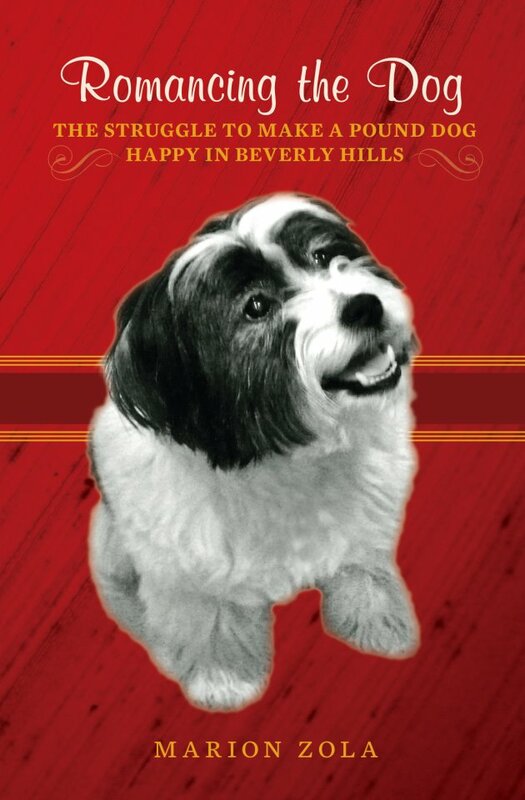 The book is about Claude (a rather “Snoopy-esque” looking Beagle I presume? Only Claude’s nose is pointier, but I digress) , who loves to go on adventures! When Claude’s owners (who he refers to as Mr. and Mrs. Shinyshoes) leave for work, Claude dons his trademark beret, and takes off with his best friend, Sir Bobblysock (“who is both a sock and very bobbly”), and they decide what adventure they will have that day. Claude in the City is the first of what will be a book series featuring Claude. In this book, Claude and Sir Bobblysock visit the city for the first time. It starts off as an ordinary day as they visit local shops, have tea and visit a museum (where Claude accidentally foils a robbery!) That sure is no “ordinary” day, that day became an extraordinary day, that is for sure! If you are looking for a fun book for the little ones in your life, Claude in the City fills the bill! 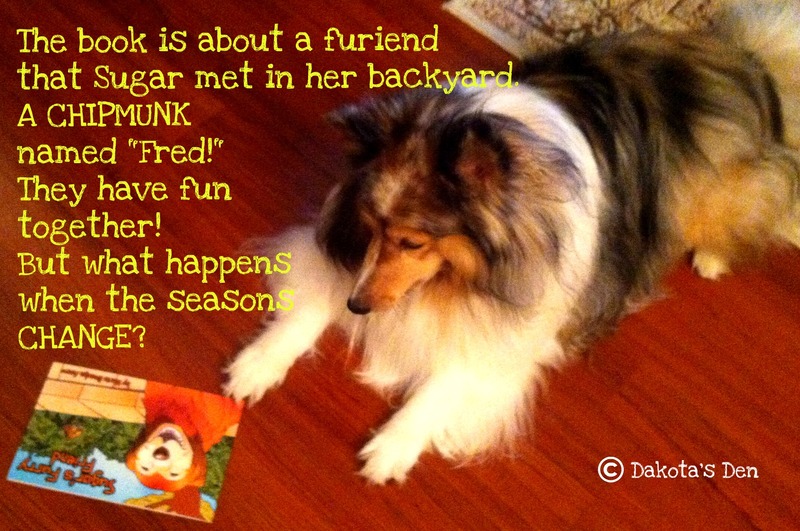 The series will continue with Claude at the Circus (coming Fall 2013) and Claude at the Beach (coming Spring 2014). ABOUT THE AUTHOR from Peachtree Publishers: Alex T.Smith briefly considered careers in space travel, cookery and being a professional rabbit before finally deciding to become an illustrator. He graduated from Coventry University with a degree in Illustration and won second place in the Macmillan Prize for Children’s Illustration. He lives in England under the constant supervision of his canine companions-two very tiny, very naughty Chihuahuas and an ancient and very bossy Yorkshire Terrier. In full disclosure: I was not compensated for this review. I was sent a copy of the book to read/review/feature on Dakota’s blog. All opinions are my own. February is the month of love and it is appropriate that in the month of February we celebrate our love of dogs. Our dogs. The dogs of people we know. Dogs who are in shelters, their pleading innocent eyes gazing back at ours with the hopes that we just might become their forever homes. The “owners”, “parents”, whatever you wish to call them, who hold these beautiful beings close to their hearts, should also be celebrated. Yes this book is about DOGS, but the love and dedication that is clear in this touching book applies to EVERYONE who has ever loved an animal. Dog or not. In celebration of this love, I am thrilled to present to you the book: Romancing the Dog by Marion Zola. From the publisher: Romancing the Dog, a humorous memoir, reminds the reader just how much one dog can transform human lives. It will take you on a romp of unique adventures laced with poignant moments. When Chips, a rescue dog, enters the neat routines of a middle-aged couple and messes them up in the most delectable ways, the new guardians are led from one challenging situation to another. A Tibetan Terrier who always seems to have the upper paw, he sends Marion’s and Sam’s stress levels off the charts. Readers will smile, laugh and cry as they follow this trio through the journey of angst and joy. I felt an instant sense of familiarity when I read that Author Marion Zola once loved a dog named Chips in her childhood who belonged to someone else. My love of Shetland Sheepdogs began with a dog named Dandy, a feisty Shetland Sheepdog who also “belonged to someone else”, our neighbors across the street. Truth be told, I was 5 yrs old at the time and ONLY played with the 3 children who lived with Dandy because I was madly in love with their dog. That is when my love of Shetland Sheepdogs began. 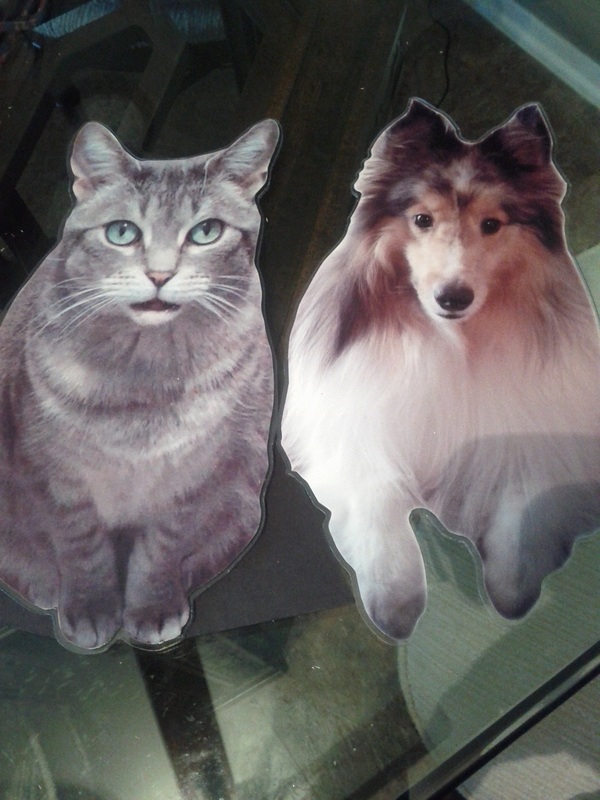 I was determined that one day I would own my own Shetland Sheepdog. Now I do, my precious Dakota. When Dakota came into mine and my husband’s life, our “neat routines” were also “messed up.” Dakota also has the “upper paw” and often, sends OUR stress levels “off the charts” as well. It is just those things that make us love him that much more, it was the same with Chips, it is the same with all of us who love, have loved, and are loved by animals. We all know that moment of looking into a beloved animal’s eyes for the first time and knowing in our guts that “THIS is the ONE.” Author Zola and her husband, Sam, spend their years with Chips making him the center of their universe. Their lives are dedicated to making sure that Chips is happy, that all of his needs, and then some, are being met. Certain that Chips had been abused before he ended up in a Shelter, Marion and Sam were determined to make Chips feel secure, confident and always LOVED. Through illnesses, allergies, attempts to find a “job” for Chips, separation anxiety, there are countless moments of sacrifice, worrying, and loving to the nth degree that we all can relate to. Before Dakota, my only other pet as an adult was my “soul kitty” named Bobo. He came into my life as a stray and lived with me for 18 wonderful years. Yes dog lovers, because I have shared my life with a dog for only 6 years, I relate to this book more as a cat mother. Romancing the Dog reminded me of the lengths I went to throughout Bobo’s 18 years to make sure that he had the most marvelous life ever, and that the end was as peaceful and full of love as it could be. This book brought back joyous as well as painful memories of Bobo and as a new and rather inexperienced dog mother, let me know that some of my fixations and obsessions are indeed, NORMAL. They are normal to all of us who have made the life-long emotional, financial and physical commitment to care for one who depends on US for everything of value in their world. Romancing the Dog is a must-read for dog lovers, ANIMAL lovers. You will recognize yourselves described on the pages, and you will fall in love, with Chips, Marion and Sam, just as I did. In full disclosure: I was not compensated for this review. I was mailed a copy of the book by the author for review purposes. All opinions are my own. 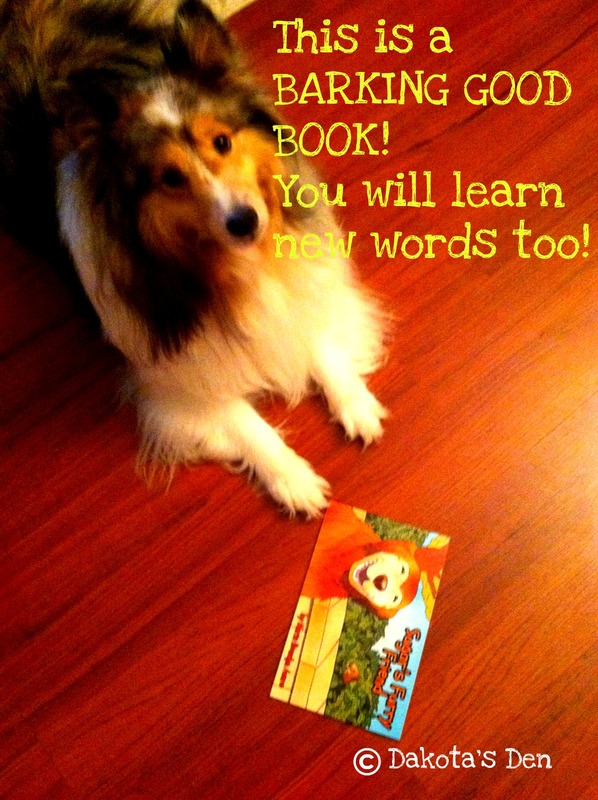 Looking for a book for the youngsters in your life that sends the message of love, friendship and loyalty? Have you wondered what life was like BEFORE there were dogs? Why did dogs inhabit Earth? From the Publisher: Out in space, on the other side of the sun is the Planet Of The Dogs. This is the story of the first time dogs came to planet earth to teach people about love and to save the farmers of Green Valley from the invasion of the Stone City warriors. 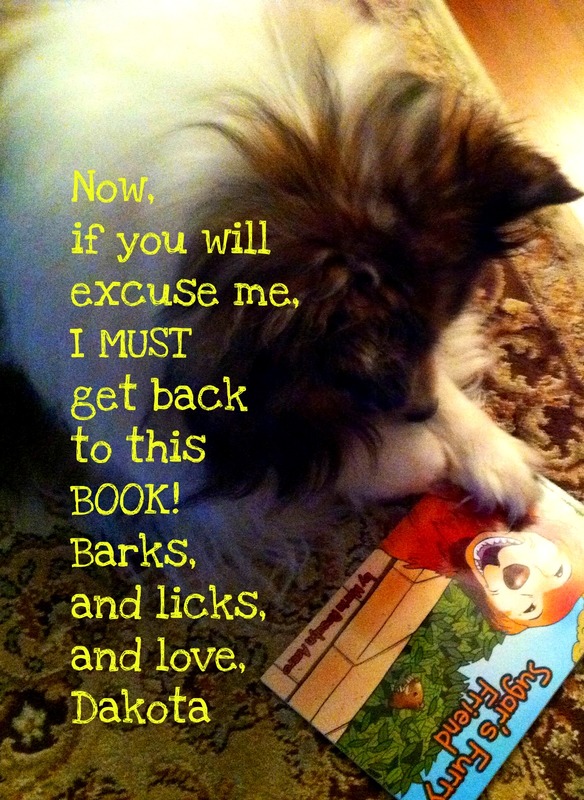 Planet of the Dogs is a delightful fantasy for those in the mid to upper elementary grades as well as their parents, aunts, uncles and grandparents! The story begins in a time long ago before there were dogs on Planet Earth. For a while things were beautiful, people prospered and life was good. Then, as is often the case, where there is good, to have balance in life there must be some bad. Planet Earth was threatened by evil forces. These forces made some people forget how to love. When Miss Merrie (Queen of the dogs on Planet Dog) heard of the problems on Earth she knew that something had to be done to help them. The first dog arrived and the course of the world changed. People learned about loving without judging, devotion, the rewards of hard work, protection, peace and much more. Planet of the Dogs is a quick read for adults. The resplendent imagery, is sure to captivate, delighting the imaginations of the young readers by transporting them to a fantasy place where dogs are the heroes and heroines. When I first met Author Billi Tiner on Twitter and saw the cover of The Rescue Team, the first thing that intrigued me about this wonderful book for youngsters in the “middle grades” or grades 9-12, was the cover! The cover features the two “stars” of this heartwarming and excitement filled book, Ellie, a Border Collie with an endearing “smile” and a penchant for “spinning”, ( Shelties can certainly relate! ), who was unceremoniously “dumped” off at a shelter when his owners discovered they were going to have a baby, and Toby, a silver-gray tabby cat, who was also treated less than admirably by his owners. For those who read both of my blogs, do these two remind you of anybody? to purchase in paperback or Kindle form, click on the book cover! That’s right! The two featured on the cover remind me of my Dakota and Cody! When I read the first few pages I was hooked! There were many things that I loved about this book, but one of the main themes that I loved was the “pay it forward” message that Ellie and Toby display throughout the entire story. Having been rescued, they live their lives rescuing OTHERS, both people and other animals. Ellie, being a “working” dog, finds her “job”, her “purpose” rescuing others with Toby the cat, working devotedly by his side. There are delightful “messages” or “lessons” that are learned when young people AND adults read The Rescue Team. The “pay it forward” message is clear but there are more messages such as, the power of love, devotion, determination, trust, courage, hope, to name a few. The Rescue Team also teaches us how, often our first impressions can be wrong, as exhibited when Toby the cat is startled by Tank, the “huge” dog with the “freaky” eyes (one blue, one brown) that sent Toby running up the first tree that he could find! The Rescue Team is a quick read, fast-moving, exciting, packed with warmhearted “feel good” moments and lessons that can be learned by both young people and adults alike. Be sure to put this one on your MUST READ list!